When law and morality contradict each other, the citizen has the cruel alternative of either losing his moral sense or losing his respect for the law. 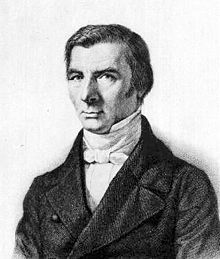 Frédéric Bastiat (30 June 1801 – 24 December 1850) was an early free-market economist and classical liberal French author. L'État c'est la grande fiction à travers laquelle tout le monde s'efforce de vivre aux dépens de tout le monde. The State is the great fiction through which everyone endeavours to live at the expense of everyone else. The State in Journal des débats (1848) par. 5.20. The profit of the one is the profit of the other. In the department of economy, an act, a habit, an institution, a law, gives birth not only to an effect, but to a series of effects. Of these effects, the first only is immediate; it manifests itself simultaneously with its cause — it is seen. The others unfold in succession — they are not seen: it is well for us, if they are foreseen. Between a good and a bad economist this constitutes the whole difference: the one takes account only of the visible effect; the other takes account of both the effects which are seen and those which it is necessary to foresee. Now this difference is enormous, for it almost always happens that when the immediate consequence is favourable, the ultimate consequences are fatal, and the converse. Hence it follows that the bad economist pursues a small present good, which will be followed by a great evil to come, while the true economist pursues a great good to come, at the risk of a small present evil. That which is seen and that which is not seen (Ce qu'on voit et ce qu'on ne voit pas, 1850), the Introduction. Either fraternity is spontaneous, or it does not exist. To decree it is to annihilate it. The law can indeed force men to remain just; in vain would it try to force them to be self-sacrificing. If socialists mean that under extraordinary circumstances, for urgent cases, the State should set aside some resources to assist certain unfortunate people, to help them adjust to changing conditions, we will, of course, agree. This is done now; we desire that it be done better. There is however, a point on this road that must not be passed; it is the point where governmental foresight would step in to replace individual foresight and thus destroy it. [The socialists declare] that the State owes subsistence, well-being, and education to all its citizens; that it should be generous, charitable, involved in everything, devoted to everybody; ...that it should intervene directly to relieve all suffering, satisfy and anticipate all wants, furnish capital to all enterprises, enlightenment to all minds, balm for all wounds, asylums for all the unfortunate, and even aid to the point of shedding French blood, for all oppressed people on the face of the earth. Who would not like to see all these benefits flow forth upon the world from the law, as from an inexhaustible source? … But is it possible? … Whence does [the State] draw those resources that it is urged to dispense by way of benefits to individuals? Is it not from the individuals themselves? How, then, can these resources be increased by passing through the hands of a parasitic and voracious intermediary? ... Finally … we shall see the entire people transformed into petitioners. Landed property, agriculture, industry, commerce, shipping, industrial companies, all will bestir themselves to claim favors from the State. The public treasury will be literally pillaged. Everyone will have good reasons to prove that legal fraternity should be interpreted in this sense: "Let me have the benefits, and let others pay the costs." Everyone's effort will be directed toward snatching a scrap of fraternal privilege from the legislature. The suffering classes, although having the greatest claim, will not always have the greatest success. Justice and fraternity, in Journal des Économistes, 15 June 1848, page 324. Economic sophisms, 2nd series (1848), ch. 1 Physiology of plunder ("Sophismes économiques", 2ème série (1848), chap. 1 "Physiologie de la spoliation"). It is a rather singular argument to maintain that, because an abuse which has been permitted a temporary existence, cannot be corrected without wounding the interests of those who have profited by it, it ought, therefore, to claim perpetual duration. There are multiple English translations available, the most recent one is done by Dean Russell "into twentieth century, idiomatic English". The quotes below are from this translation in the order they appear in the original work. Thus, if there exists a law which sanctions slavery or monopoly, oppression or robbery, in any form whatever, it must not even be mentioned. For how can it be mentioned without damaging the respect which it inspires? Still further, morality and political economy must be taught from the point of view of this law; from the supposition that it must be a just law merely because it is a law. Another effect of this tragic perversion of the law is that it gives an exaggerated importance to political passions and conflicts, and to politics in general. Legal plunder can be committed in an infinite number of ways. Thus we have an infinite number of plans for organizing it: tariffs, protection, benefits, subsidies, encouragements, progressive taxation, public schools, guaranteed jobs, guaranteed profits, minimum wages, a right to relief, a right to the tools of labor, free credit, and so on, and so on. All these plans as a whole — with their common aim of legal plunder — constitute socialism. Essayez d’imaginer une forme de travail imposée par la Force, qui ne soit une atteinte à la Liberté ; une transmission de richesse imposée par la Force, qui ne soit une atteinte à la Propriété. Si vous n’y parvenez pas, convenez donc que la Loi ne peut organiser le travail et l’industrie sans organiser l’Injustice. Le plus pressé, ce n'est pas que l'État enseigne, mais qu'il laisse enseigner. Tous les monopoles sont détestables, mais le pire de tous, c'est le monopole de l'enseignement. The most urgent necessity is, not that the State should teach, but that it should allow education. All monopolies are detestable, but the worst of all is the monopoly of education. In 'Cursed Money! ', final thought. The shallowest and therefore the most successful representative of the apologists of vulgar economics. Karl Marx, Frédéric Bastiat: Two Hundred Years On. Mises.org. Retrieved on 2008-12-02. In three years every Frenchman can know how to read. Do you think that we shall be the better off? Imagine on the other hand that in each commune, there was ONE bourgeois, only one, who had read Bastiat, and that this bourgeois was respected, things would change. Gustave Flaubert, The George Sand-Gustave Flaubert Letters. Ebooks.adelaide.edu.au. Retrieved on 2008-12-02.